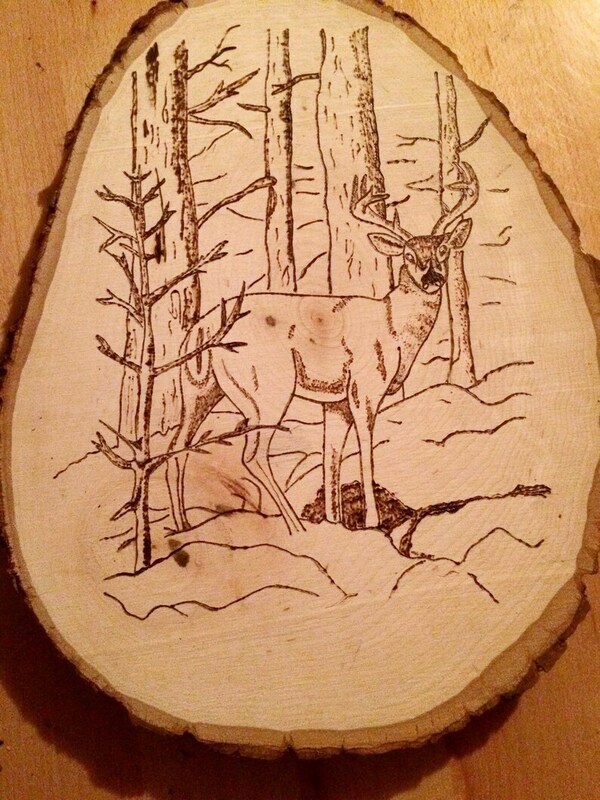 This piece is made of real pine wood with the bark still on it and is a hand detailed wood burning of a buck in the woods. Great piece for a cabin or lakeside cottage. Item was wood burned free hand by Dennis. * Approximately 9" to 11" because this is real wood there is no guarantee on an EXACT size. Like us on Instagram and Facebook to stay up to date on new products and special offers! All orders Nov-end of Dec will be wrapped in holiday themed paper unless specified in the order's notes. Gifts will be wrapped neatly w/ a bow on top. Very beautiful. A poignant Christmas gift for my stepdaughter in memory of her mom. Thank you. It shipped on time in adorable packaging. These large rainbow sparkle magnets look great. Repeat customer for the wonderful magnets made by Jessica for this great Etsy shop! Perfect transaction as always! Payment is accepted via PayPal, credit cards, and Etsy gift cards. Custom orders: payment in full is required before we begin work on your item. Our goal is to make our customers shopping experience one that is easy and pleasant. All items listed are photographed and described as clearly as possible. Please contact us within 14 days of receiving your purchase if you want to return it for a refund. If an item is broken or damaged, we require that at least 2 clear photos of any damage be emailed to us via our messages on Etsy within 14 days of receiving your purchase. Returns need to be pre-approved by contacting us through a "Convo" (an Etsy Conversation). Items must be returned in the original packaging and in excellent condition within 10 days of return approval. Customer is responsible for the return shipping cost. We recommend adding delivery confirmation (tracking number) to any returned packages. Any returned packages that are lost, stolen, not delivered or have no proof of mailing will not receive a refund. REFUNDS: Upon receipt of the returned item, you will be credited for the purchase price less the original shipping cost. Customer is responsible for all shipping costs to return any item for refund. US orders will ship via the USPS. International orders will be sent via USPS First Class International. Buyer can feel free to message us prior to purchase if they would like a quote for upgrading to Priority Mail International. If paying by PayPal: Please be sure your PayPal address is current. For your protection and mine, ORDERS ARE SHIPPED TO THE ADDRESS ASSOCIATED WITH THE PAYPAL ACCOUNT - unless you specifically state in the order details why you want the package delivered to a different address. Please keep in mind that once a package is out of our hands we have no control over when, how, or if it arrives to its destination. In the unlikely event that a package does go missing, contact us and we'll do all we can to help you find it. Reserved listings will be held for 3 days unless other arrangements have been agreed upon between buyer and seller. After that time, the reserved item will be re-offered to any potential buyer. If buyer decides not to purchase the reserved item, a convo prior to the 3 day period stating that they aren't going to purchase the item would be greatly appreciated. Custom orders: We LOVE doing custom orders for our customers!! We'll send you convos during the process of creating your item and also include photos when we're finished. Please note that custom orders can take a few days to make but we will give you and estimate on the amount of time we'll need to make your item. Feel free to communicate with us about your timely needs and we will do our best to accommodate. PLEASE NOTE: custom orders must be paid for in full before we can begin work, when you request a custom order we'll create a listing specifically for you. We will only leave that listing up for 7 days. International Buyers: Please note that you are responsible for payment of any tariffs or fees that your purchase may incur. Sometimes items can be held up in customs; we are not responsible for items that get "stuck" in customs.